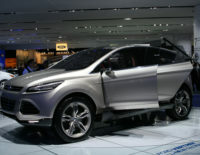 Will Ford Vertrek Concept be the Next Generation Escape? To be blunt, the Ford Escape is more than long in the tooth. The driving experience is closer to what one might expect from a new small SUV a decade or more ago. While the Europe-only Ford Kuga is certainly more stylish and modern than the Escape, it too is going to be due for replacement in a year or so. As Ford continues to concentrate its global brand around so-called World Cars, it sounds like the plan is for the Vertrek Concept to replace both the Escape and Kuga. With styling that is closer to the Kuga in coolness, the Vertrek looks more cutting-edge than any of the other products in the CUV segment. Add to that the fact that designers have retained the cargo space available in the Escape, and Ford may well have another hit on its hands, like it had when the Canadian-built Edge was released. Ford has been developing a significant collection of small, powerful EcoBoost engines, one or more of which will likely find its way into the Vertrek here in North America. As is sadly typical, the European markets will likely get a diesel option that will not be offered here. More photos, Ford press release and video launch after the break. DETROIT, Jan. 10, 2011 – Ford Motor Company’s new Vertrek concept, revealed today at the 2011 North American International Auto Show, offers a dynamic, all-inclusive solution to what customers demand in a compact SUV across the globe, particularly in North America, Europe and the world’s largest car market, China. Key trends among customers for this type of vehicle are common to North America, Europe and Asia. They include engaging design, outstanding fuel economy and smart technologies wrapped in a right-sized package that supports an active lifestyle. The Vertrek concept previews a next-generation product with a sleek, modern design and yet maintains the generous cargo volume offered by the current Ford Escape in North America, a traditional compact SUV with 66.3 cubic feet (1,879 liters) behind the first row and 29.2 cubic feet (828 liters) behind the second row. The concept is also created to show how an all-new Ford compact SUV could offer substantially more cargo volume than the current Ford Kuga sold in Europe, yet still retain design leadership in its segment. In production, a vehicle based on the Vertrek concept could offer about 15 percent more cargo volume behind the first row than the Kuga and around 20 percent more cargo volume behind the second row. A wide suite of customer-focused Ford technologies including SYNC®, active park assist, BLIS® (Blind Spot Information System) with cross-traffic alert and Intelligent Access with push-button start are featured in the Vertrek concept. Powertrain technology is also advanced, providing anticipated best-in-class fuel economy with the 1.6-liter Ford EcoBoost™ gasoline engine featured in the concept vehicle as one of the future powertrain choices. The concept also previews the Ford Auto Start-Stop system, which contributes further to fuel efficiency and low emissions. Launched in North America and now being introduced worldwide, Ford’s expanding line of award-winning EcoBoost engines produces power comparable to larger, naturally aspirated engines with the fuel economy of smaller-displacement engines. EcoBoost is fundamental to Ford’s strategy to provide technologically advanced, high-output, smaller-displacement powertrains that deliver uncompromised performance and fuel economy. Ford EcoBoost engines deliver fuel economy gains of up to 20 percent and reduction of CO2 emissions of up to 15 percent, compared with larger, less efficient powertrains. In addition to turbocharging with direct injection, Ford engineers have enhanced EcoBoost’s technology capabilities by adding variable valve timing and precisely controlling all aspects of the engine. Ford has at least 125 patents on its EcoBoost technology. The Vertrek concept could also easily use one of Ford’s wide range of efficient and powerful diesel engines offered in markets outside the U.S. For example, the acclaimed 2.0-liter Ford Duratorq® TDCi (turbo diesel common-rail direct-injection) engine has recently been upgraded to deliver even higher efficiency with improved performance, fuel economy and refinement. Paired with the high-tech engines are fuel-saving six-speed transmissions. By 2013, all Ford vehicles in North America will incorporate a six-speed transmission as part of the company’s commitment to leadership in fuel economy in all vehicle segments. Ford’s global data show that compact SUV customers increasingly use their vehicles for weekend getaways, making improved highway fuel economy a must. This highlights the importance of the aerodynamic design of the Vertrek concept, and it led to the inclusion of an accessible, small-displacement internal combustion engine in the vehicle rather than a hybrid or electric powerplant that might be more attuned to city dwellers.